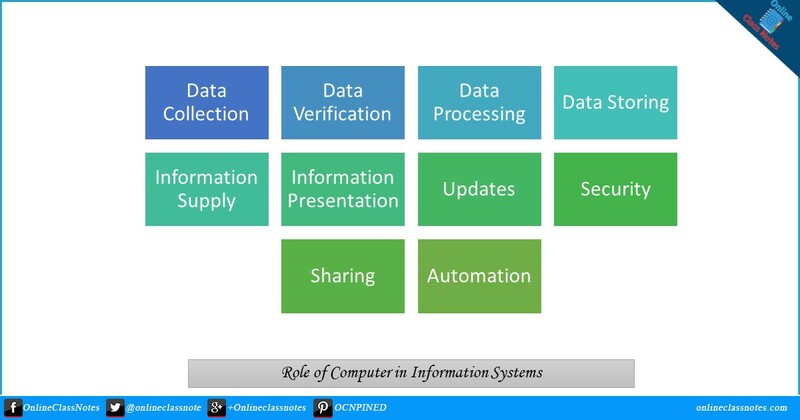 What are the roles of computer in Information System? Information systems are in use from an ancient time. With the development of computing technology, computers became an important part of today's modern information systems which satisfies speed, dependability etc. Information systems collect, store and supply data. This is done by using computers. Data can be collected from computer networks or can be inserted by human resources. Software resources can also automate the collection of data (searching and finding best results) which is the most important part. Data in information systems can be verified using computers. Thus data can be corrected or rejected before going to the processing level which final helps in getting accurate information. Data in information systems can be processed (sorted, filtered, joined etc.) by computer to finally generate information that is desired, useful, meaningful to human resources or other information systems. Various program takes part in data processing. Data is everything in information systems. Today's computers can store enormous amount of data. Information can derived from these stored at any time using data processing. Computer can supply or provide information to human or another information system which can scheduled or manually operated. Computers can not only provide a long table filled with data in an informative way, but it can also represent data in graphs, charts, images, comparative way that is much more meaningful than a long tabular data sheet. With time, stored data can turn into obsolete data as might be the data is changing in real time. So it is required to update data as it changes and computers can do this really fast and with ease. Thus all the information provided by information systems will be up-to-date and more precise. Information in information systems can be general to highly confidential. Though computer systems are not 100% secured but at least they can confirm security at a very high level with comparatively less cost. Computers can secure data with various technologies like access control, data encryption etc. Computers enable the sharing of information to the next level. Using various network resources, computers enables a system to share information automatically to an application, human etc. Computers in information systems can turn the system to automate some of the task that generally requires one or more human resources. Such as, generating reports, sending reports in emails etc. Advanced information systems can also use artificial intelligence to automate more by tracking user behavior and interaction with the system.